Last week after I got my hair cut, I was sitting in my car waiting for Doug to show up and passed the time by taking a few pictures out of my car window. I was trying to take a close up of a sparrow that was sitting on top of the hedge by my car, but he flew away so I ended up with a picture of this little cutie instead. But the sparrow came back. I then noticed that his lighter feathers were blue! I didn't know that blue sparrows actually existed, so I googled it and found out that they've been spotted in Australia too, but some people still think that they don't exist. Anyway, this one was hanging out across from the Chipotle, next to the New Wave Salon on Rockville Pike. He almost looks like a parakeet in this photo, but he was definitely a sparrow as far as I can tell. The blue sparrow in Australia was prettier than the one I saw - the color is absolutely amazing! "My" sparrow is a little more subtle. There's some additional discussion of the blue sparrow phenomenon on this website. Check it out, there's a really great photo there too. I've been complaining, mostly to myself, about the pathetic lack of travel that exists in my life these days. My big trip to Delaware happened this past weekend. We played an Andrews Sisters show/concert at a casino for Veterans Day Weekend and stayed overnight since they had a room for us. It made me feel a bit nostalgic for my former life on the road because there were a lot of similarities - the 1940s theme, the army uniform, the enthusiastic crowd, the onstage big band, the meal before the gig, the hotel afterwards, etc, etc. After five years of not touring it was interesting to be able to observe what I miss and what I don't miss. The next day we got up and went to Rehoboth since that was the closest beach. This will probably be my last beach trip this year - the other day trips (two of them) were to Assateague. I haven't been to Rehoboth in several years. We had to make it quick because my bass was in the car. It was parked in a shady spot, but I still don't like to leave it for very long. We took a short walk on the beach, had a slice of Grotto Pizza, got some warm caramel corn at Dolle's for dessert, and stopped at the awesome coffee shop at the edge of town out by Route 1, so it was a completely satisfying Rehoboth experience except for the lack of beach time. The beach is kind of small at Rehoboth. And the sand is grayer than it is at Assateague. The waves were huge! If the water had been warmer I would have gone in. I like big waves, especially out past the breakers, where they lift you up but you don't get smashed by them. I'm looking forward to next summer already! And here are some more pictures of the blue sparrow in Australia. They are really fantastic, so go have a look! I cannot imagine going from so much travel to so little. Some of us are just built to see the world, but your corner of it has sure had a lot going on lately. It makes sense that you've been grounded. Look at what you see from home, though. You capture such fabulous images and look at that bird! It was very hard for me to give up that life, not entirely by my own choice. And having to turn down so many ship gigs while the end was in sight (which lasted for over two years) was even harder. I crave travelling! But you're right - there's plenty to see and appreciate here at home too! Thanks for checking him out, John! 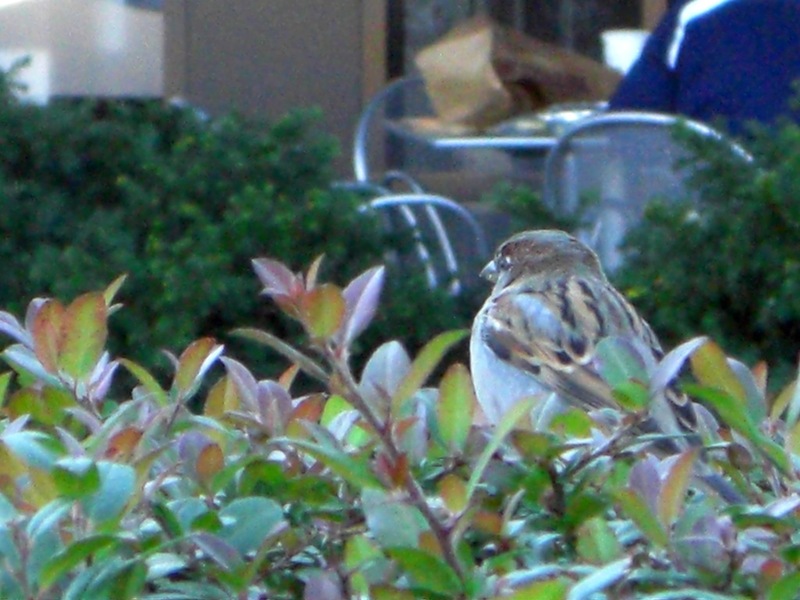 I was rather surprised when I noticed he was kind of blue - all of the other sparrows hanging around were plain old brown.